The Solomon R. Guggenheim Museum is pleased to present three new dynamic, site-specific installations by artist Daniel Buren. Known for his work that explores the formal, social, and ideological structures informing the presentation and reception of a work of art, Buren will transform the legendary Frank Lloyd Wright–designed rotunda with a work that creates a challenging and engaging dialogue with the museumís powerful architecture. Associate Curators Susan Cross and Joan Young introduce members of the YCC to the Guggenheim Museumís spring exhibitions. This spring the Guggenheim Museum will host First Fridays from 9 PM to 1 AM, when, in addition to experiencing the museum's progressive contemporary art exhibitions, you'll be able to listen to some of New York's hottest DJs spin music in the museum's spectacular Frank Lloyd Wright-designed rotunda. April 1: Dina Regine, May 6: Laurent Vacher of Labtonic, June 3: Patchi. Sip a cocktail at the cash bar or wind your way up the spiral ramp to explore The Eye of the Storm: Works in situ by Daniel Buren, The Hugo Boss Prize 2004: Rirkrit Tiravanija, and Masterpieces of Early Modernism. $15 (cash only please), FREE for members and IN:NYC (SM) Card members. For more information about IN:NYC (SM), visit www.innyc.com. Join other members for a private preview of the Guggenheim Museumís spring exhibitions: The Eye of the Storm: Works in situ by Daniel Buren, The Hugo Boss Prize 2004: Rirkrit Tiravanija, Recent Acquisitions: Slater Bradley's Doppelganger Trilogy, and Masterpieces of Early Modernism. Associate Curators Susan Cross and Joan Young give an introduction to the Guggenheim Museumís spring exhibitions. This docent-led orientation provides a brief introduction to Daniel Buren's site-specific installations. Orientations take place in the rotunda and discuss how Buren's work explores the relationship between artwork and art institution. Join the curator of The Eye of the Storm: Works in situ by Daniel Buren for tours of the exhibition. Join Guggenheim Education staff for tours of the exhibition The Eye of the Storm: Works in situ by Daniel Buren. Lectures take place in the Peter B. Lewis Theater of the Sackler Center. Unless otherwise noted, lectures are $10 ($7 for members, students, and seniors). For more information, call the Box Office at (212) 423-3587. The Guggenheim is pleased to offer a comprehensive series of programs dedicated to the work of Daniel Buren, examining his work and thematic concerns through conversations with leading artists, critics, and historians. Daniel Buren and noted scholar Alexander Alberro discuss the sculptural and architectural works the artist has made in situ over the past two decades. A leading authority on Conceptual art, Alberro is an Associate Professor of Art History at the University of Florida, Gainesville. A panel of artists and art historians addresses Burenís groundbreaking work of the 1960s and '70s in the context of the dominant trends in art production in the U.S. during that period. Leading authorities on Minimalism, Conceptual art, and performance debate how Burenís work corresponded to and differed from that of his peers in America. Distinguished critic and art historian Douglas Crimp speaks about his earliest encounters with Daniel Buren's work. As a curatorial assistant at the Guggenheim Museum in 1971, Crimp experienced firsthand the Guggenheim International Exhibition, 1971 from which Buren's contribution was removed. Crimp discusses this historic event and the critical significance of the artist's work in the late 1960s and '70s. Over thirty years ago, Daniel Buren began a dialogue with the powerful architecture of the Frank Lloyd Wright–designed rotunda with his creation of a 65-foot banner. The artist speaks about his current project for the Guggenheim and responds to the reactions the exhibition has garnered from both critics and museum visitors. Museums and galleries, as well as numerous non-art venues, have been both subject and site for Daniel Buren since the 1960s, when he first began investigating an art work's inextricable relationship to the context in which it is seen. An international panel of contemporary artists discusses Buren's influence, as well as the role of institutional critique in their own work and in the current cultural landscape. Tickets are $20 ($15 for members, students, and seniors). Supporting Associates and Patrons Circle members free with reservations. 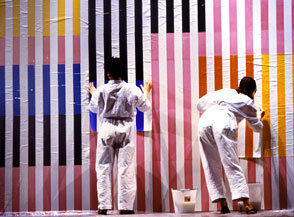 Daniel Buren premieres this New York performance in which his signature colored stripes come alive on stage. Colors overlap, harmonize, appear, and disappear at the artistís direction. Subsequently, the performers tear the papers off, revealing odd shapes and lacerated bits of the forgotten colors underneath. Art historian RoseLee Goldberg provides introduction and commentary. Family Workshops are open to children ages 7–13 with an adult companion. $20 for one child, plus one free adult ($15 for members' children); $15 per additional adult or child. To register, please call (212) 423-3587. Investigate the ways that artist Daniel Buren has reflected and engaged the architecture of the Guggenheim Museum and create a design for your own site-specific work in the museum's rotunda using Adobe Photoshop and digital photography. Advance registration required. No previous computer experience necessary. Instructor: Rosanna Flouty, Manager for New Media. Experience two very different kinds of architecture with your family. Participants explore the unique architecture of the Guggenheim Museum, as it is reflected in the exhibition The Eye of the Storm: Works in situ by Daniel Buren. Then, journey two blocks north to explore the Cooper-Hewitt National Design Museum. Families work together to create a building of their own design. Instructors: Educators from the Guggenheim Museum and the Cooper-Hewitt, National Design Museum. Children participate in interactive gallery visits followed by hands-on studio-art workshops. The program culminates with a showcase where students invite their families to view the work they have created. To ensure individual attention, this program is limited to 15 participants. Open to children ages 8–11. $275 ($250 for members' children). For information or to register call (212) 423-3637. Participants explore The Eye of the Storm: Works in situ by Daniel Buren, and digitally create their own site-specific installation proposals using Adobe Photoshop and 3-D modeling software. Guest Instructor: Austin Fisher. Open to high school students ages 14ñ18. No prior multimedia experience necessary. $35 fee includes all materials. Contact Rosanna Flouty, Education Manager for New Media at (212) 423-3532 for an application. Join us for an afternoon of looking, learning, and mingling with colleagues. Tour The Eye of the Storm: Works in situ by Daniel Buren, learn about upcoming programs, receive curriculum materials designed in conjunction with the exhibition, and meet the Education Department staff. RSVP to (212) 423ñ3231. Participants explore the exhibition The Eye of the Storm: Works in situ by Daniel Buren, in which the artist created a site-specific installation in the main rotunda and interventions in the Thannhauser Gallery windows. Educators consider the effect of the installation on the Guggenheimís architecture and design their own installations for the museumís rotunda. Instructor: Jessica Wright, Education Manager, School Programs. $20 per educator. Photo-souvenir: Couleurs Superposées: Acte V, composed and directed by Daniel Buren, Teatro Malibran, Venice Biennale, Venice, Italy, 1984. 60 minutes.